You will need three days in a row where you are home with your child. For working parents, this method works best over a three day weekend or a time when you can take off a day of work to add on to a regular Saturday/Sunday. You will be inside for most of the weekend so it important to mentally prepare yourself to spend lots of time with your child. Have fun with them! If you can't block out three days, on the final day, discuss what you have been doing with your childcare provider and ask them to continue the process. Once your child is showing signs of readiness, take them to a store and pick out underwear together. Purchasing underwear with their favorite characters is a fun way to get them excited about wearing big boy or big girl underwear. Also, since you will be spending a lot of time at home, you may want to think about some at-home projects in advance. This may be art supplies, a movie, games, cooking, baking or anything else that will keep you and your child entertained. One week in advance, let your child know that it is time to say “goodbye” to diapers. Depending on what your family decides, this could be a full goodbye or a partial goodbye where diapers or pull-ups will be used during nap and bedtime. Once you start training, underwear will be worn at all times unless your child is sleeping. Training in If you are doing a full goodbye to diapers, you can count the remaining diapers with the child and explain that when they are gone there are no more. You can still make sure only one diaper is left before bedtime the night before you begin toilet training. Share the process with your spouse and other caregivers, such as babysitters, nannies, and relatives. Take shifts (especially if there is an older sibling) or stay together and support each other during the process. It is important that all adults are involved in the process and that using the toilet does not become something that is done only with one adult in the family. By sharing the responsibility, your child learns that they must use the toilet with everyone, not just in certain situations or with specific adults. Right when your child wakes up, change him or her out of the diaper. Let your child spend at least the first day bare bottomed. Without a diaper or underpants on your child will be more likely to recognize the need to use the toilet. You may choose to put a little potty in the living room for easy access. This is a personal choice as some people may want to keep all bathroom activities in the bathroom. Give your child a big glass of water, juice or milk so they have to pee frequently. Have a constant sippy cup near your child's reach. Give your child a lot of fluid and watch intently for signs that your child is about to pee or poop. When you notice the sign, take your child to the bathroom immediately to use the toilet. Ask them if they have to go every 20 minutes. You may want to set an audible 20-minute timer so your child knows that when the timer goes off it is time to try to use the toilet. Make sure to have your child wash hands after each attempt to instill healthy habits. If your child doesn't want to try, you could say we are going to try "after you are done playing with your trains" or if your kids knows numbers, you could say "we are going to try when the clock says "10:30." 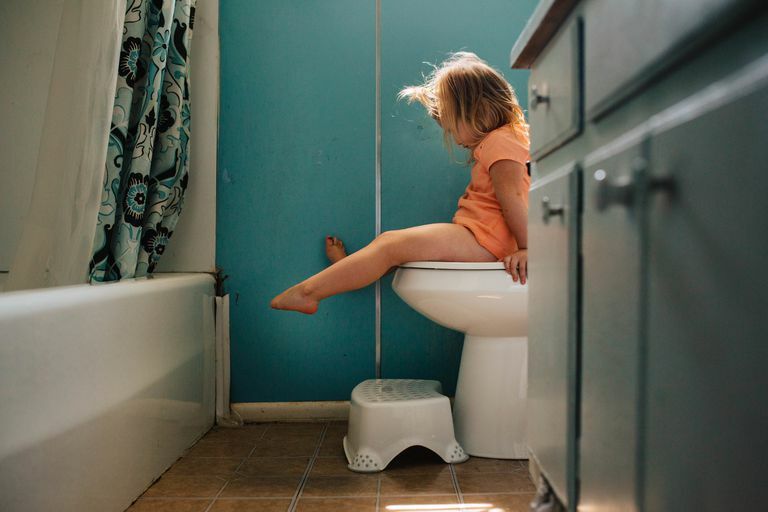 Have your child attempt to use the toilet at every transition, after cleaning up a toy/material, before snack or lunch, and before and after nap and bedtime. This will become part of their daily routine. Use emotionally expressive, behavioral observations regarding your child’s progress. “You peed in the toilet, that’s where pee belongs!” or “you peed on the floor, help me clean it up.” You know your child best. Some children respond well to an exciting celebration of success while others become uncomfortable with the attention. Some children respond well to rewards so if your child is motivated by stickers or small treats, you may decide to do a reward chart to encourage potty training. Your process for day 2 and 3 is essentially the same as day 1. Some people stay inside on all 3 days to solidify the process. Other people choose to venture outside for short activities on the afternoon of day 2 and day 3. If you go outside, go to a playground or do an activity that is close by and always remember to bring a small portable potty with you in case your child refuses to use the public restroom, as some kids do. Expect accidents. When they happen, just change the underwear and don't make a big deal. Simply say, "we pee and poop in the potty." Whether or not to put a diaper on during nap and nighttime during three-day potty training is a personal decision. Some believe it is easier to potty train completely for daytime, naps, and nighttime; others train in stages. We originally put a pull-up on for nap time and we noticed that our nanny was letting our son wear underwear during naps and he wasn't having any accident, so we talked to him about it and he wanted to wear underwear for naps. For nighttime, we are still in diapers. Have your child use the toilet before leaving home and immediately upon arriving at their destination. Bring multiple changes of clothing and underwear when you go out. Tell your teachers, daycare providers, nannies, and babysitters your child's signs when he or she needs to use the potty and what language you use at home so they can be consistent with your preferences (ie­ pee, poop, toilet, potty, doo doo, BM, tinkle, etc). Being without a diaper is a new sensation and it may feel uncomfortable or scary for some children. Remain calm and reassuring as you support your child during this process. Research has shown that a negative reaction or punishment after an accident can create a negative association to toileting and can hinder progress, so to remain calm after an accident and hide any frustration from the child. Believe in the process. It is very easy to get discouraged on day 2 when your child is having accidents, but once you make it to day 3 and beyond, your child will show you that he or she understands what it means to be potty trained.